Here is my first attempt at a new weekly series on my blog: Math Tip Monday. 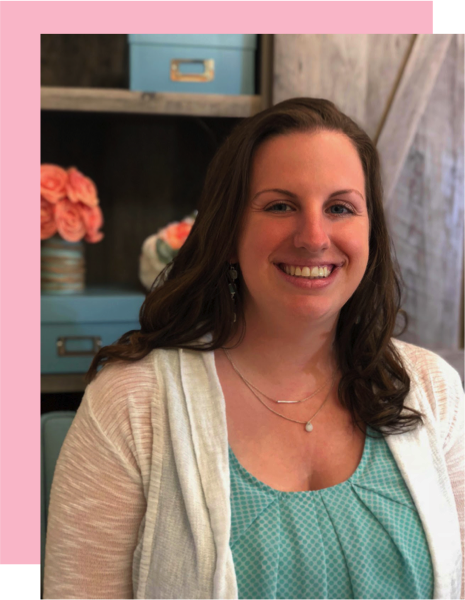 Although I have a slight obsession with children's books and I recently just earned my certification as a Reading Specialist....math is actually one of my favorite subjects to teach. To find the interactive file click Gallery (the picture frame), search "hundred", and select the Interactive and Multimedia file. Simply drag and drop into your file. Next I use the screen feature to cover up the numbers above 50. Click the Screen (like a drop down shade), and drag it up/down/left/right to cover what you don't want shown. - Number Order- I assign students a number as part of my classroom management system. We ALWAYS line up in number order. Rather than simply call numbers in sequence, I often start at a number other than 1 and count up, or backwards. This helps students pay attention (hopefully) to the numbers before and after their own. 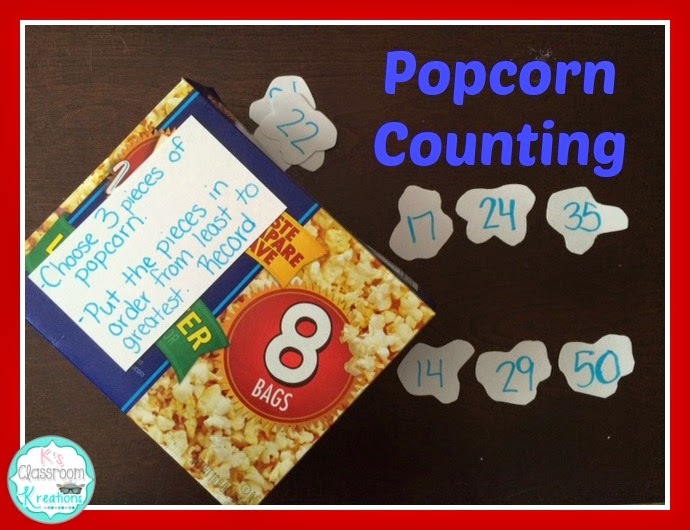 - Popcorn Counting- I cut out pieces of popcorn shaped white paper and write one number on each ( up to 50). I store all pieces inside of an empty popcorn box. 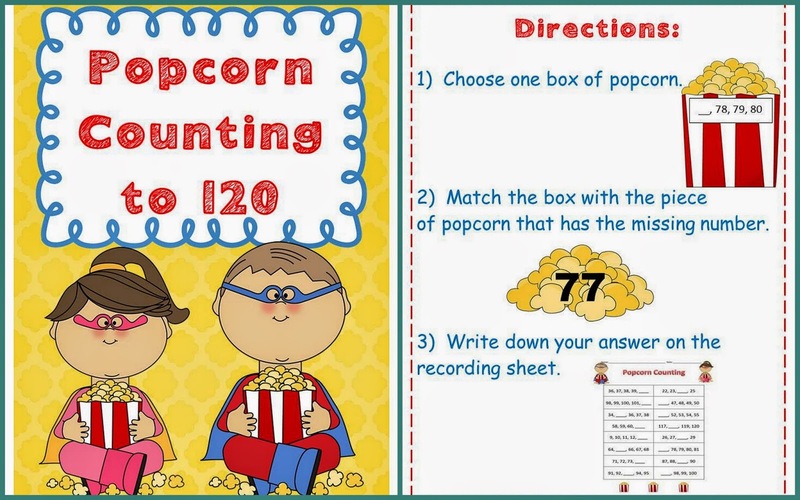 Students shake the box, pull 3 numbers out, and put them in order from least to greatest. 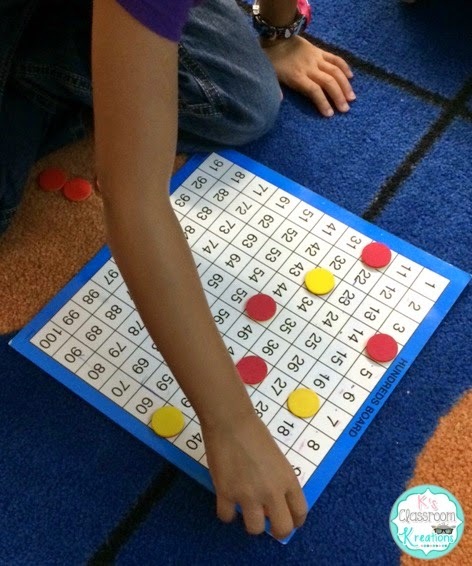 They can use a hundreds chart if they need help determining the sequence. Record in math journals and repeat. They love helping the popcorn "pop" during the box shake phase. Put a variety of objects into baggies (I normally use brown lunch bags or zippered pencil pouches). Set the bags around the room. 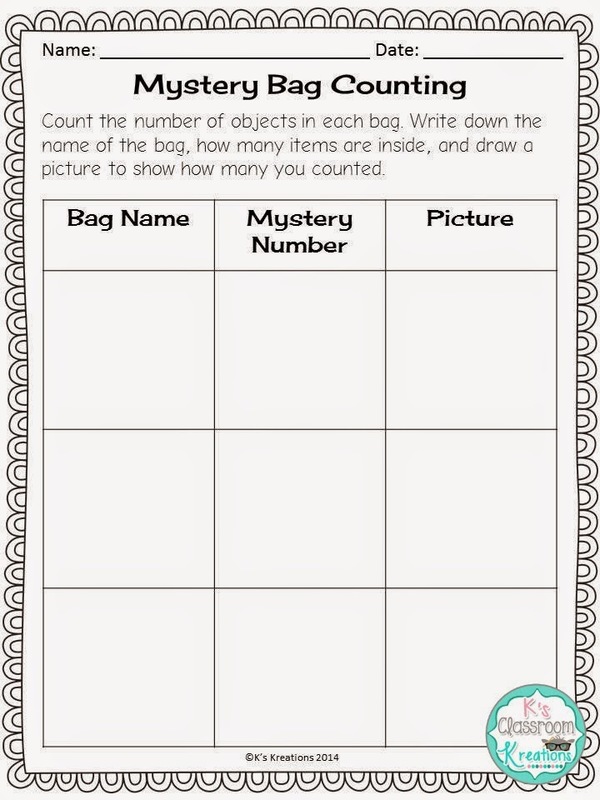 Students will work with a partner or independently to count the number of objects in each bag. They will then record the name of the bag (letter, name of object, color of bag, however you choose to name them) and the total. 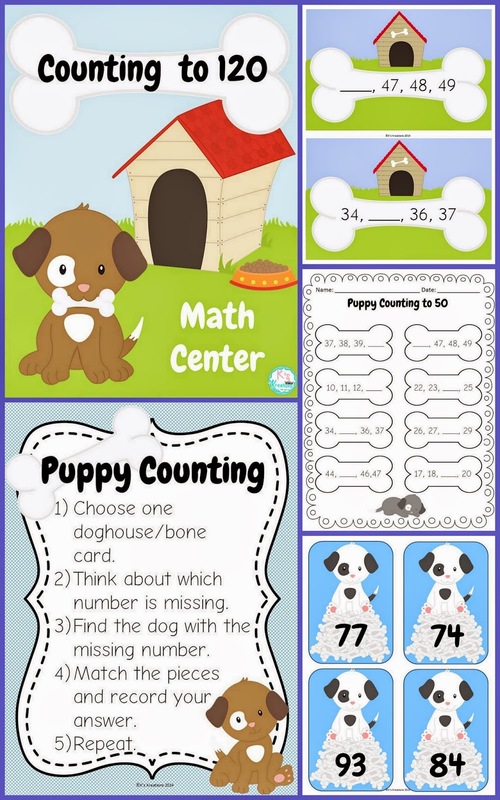 Students can also draw the number of objects to match as time allows. Switch to a new bag and repeat. I hope you have a great week. 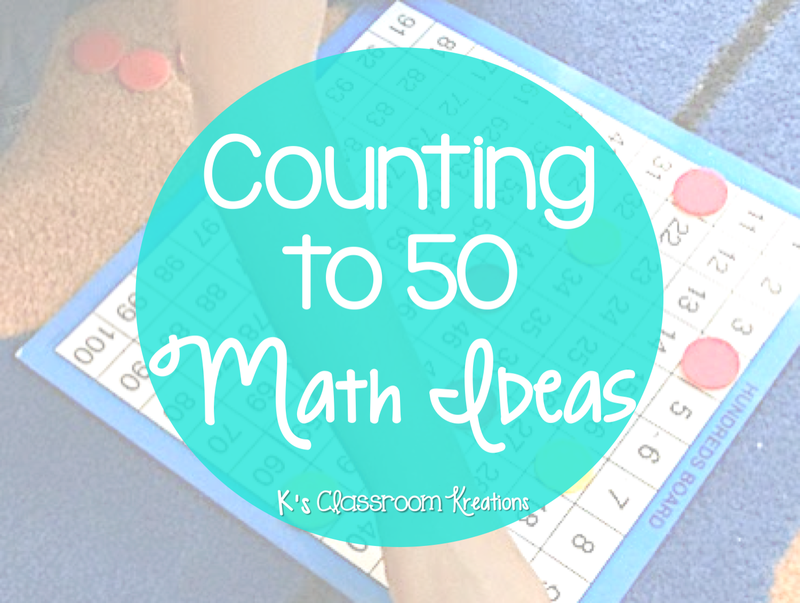 Check back next Monday for Addition & Subtraction ideas for primary students.